Did you keep track of your spending, keeping receipts and tallying them? Maybe you run a home-based business, and need to keep track of all your spending for taxes? There are many reasons you should keep your receipts, like these 5 reasons, but what about how you store them and keep track of them? Whatever reason you keep your receipts, we have a simple method outlined here for those who like a tangible method and not a spread sheet. 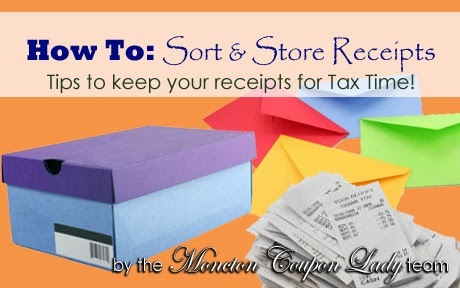 Here is the method that Natalie L uses for sorting and storing her receipts. This is a simple, fool proof process. As long as you file away your receipts right away, you'll always be able to find them when you need them. I find that organizing by month works for me, because I can usually remember when I purchased something if I have to find the receipt. After shopping I file them in the correct month’s envelope. I glance at receipts, I usually jot something down on the envelope if its something I'm likely to return or exchange like "back pack" or "sneakers". When its a major purchase, I use a separate envelope "dishwasher 2013" for example. If you keep your box on top of the fridge, it will always be close when you need to add or find a receipt. In addition to general purchases, I keep my food receipts separate. I created 24 envelopes, 2 for each month. One says "August" and one says "August Food". Running a home-based daycare, I have to keep food receipts and many other receipts for 7 years, which is another reason I find the shoe boxes work. There is 1 box for each year and they stack and store nicely. The boxes are labeled by year on the outside for quick reference. Because I have this system, I was quickly able to find over $75 worth of receipts from the time period specified in the recent Activia recall reimbursement. For more reasons to keep receipts, check out 5 Reasons To Keep Receipts.